It’s here! 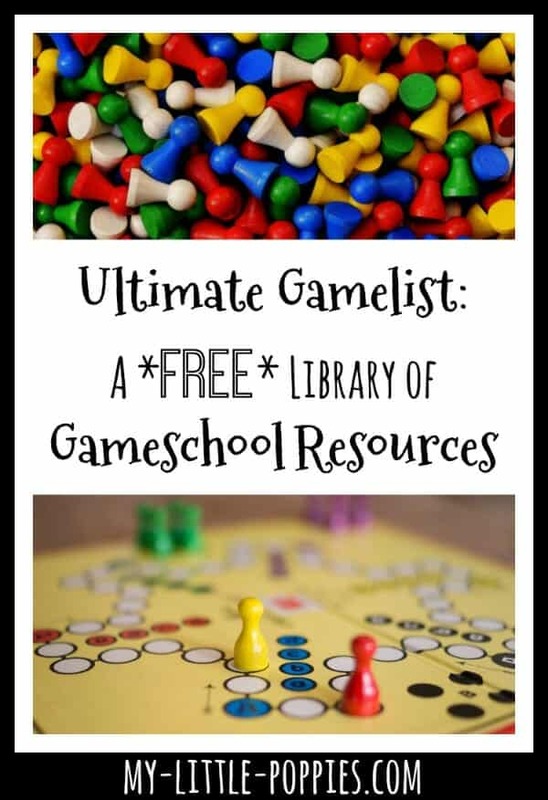 Our ultimate gamelist! Do you want to add more play to your day? Are you interest in adding more game-based learning to your homeschool? Do you want to build a family culture of games, fun, and connection? Would you love to have a go-to list of games, organized by subject, for those days when your kiddos are crying over their math books? Well, guess what I finally did? I finally made a landing page with all of my game posts, organized by subject. Then, I added some of my favorite resources. Finally, I tossed in some free printables. It’s the Ultimate Gamelist. Here are the details on the challenge…. Access to The My Little Poppies Gamelist, a free subscriber-only resource library. If you are joining the #GameschoolChallenge during our inaugural month (January 2017), you’ll want to keep reading because I have giveaway details below! The Gameschool Challenge costs nothing. Nada! Zero! Zilch! Now, it’s your turn. Tell me: What is your biggest obstacle when it comes to playing games with your family? Share here! My biggest obstacle is *ME*! I’ve never been a big game player. My kids want to play! But, mom is no fun. That’s a common issue- happens here, too! Castle Panic is our current favorite. We are loving this challenge! My favorite game right now is either Telestrations or Qwirkle! My boys would say the Grouchy Ladybug board game! My favorite board game is Shogun! Right now our favorite board game is Race to the Treasure. It’s great for my 3 – and 6 year old and as parents, we have fun too! I’m so indecisive, that’s probably it. My favorite game was always Uno as a child, although we played many. Mastermind was always a favorite of mine! With young dyslexic kids, the favorite has always been Candyland. I think my favorite game depends on who I’m playing with! With the kids (5 & 10), we’ve recently enjoyed Big Picture Apples to Apples, but Pandemic and Ticket to Ride are favorites too. I also love several Cranium games, and I have fond memories of Taboo and Scattergories from my teen years. My favorite board game is Clue. I hadn’t played it in years and we just got it for the kids as a Christmas gift. They really like it too. I love Rummikub and Blokus but the kids’ favorite is Connect Four! My kids are loving Sum Swamp and Sneaky Snacky Squirrel right now. We seem to run out of time with complicated games, so our go-to has become Spaceteam. Our favorite board game as a family is Catan Junior, and my favorite game to play with my husband is Pandemic! 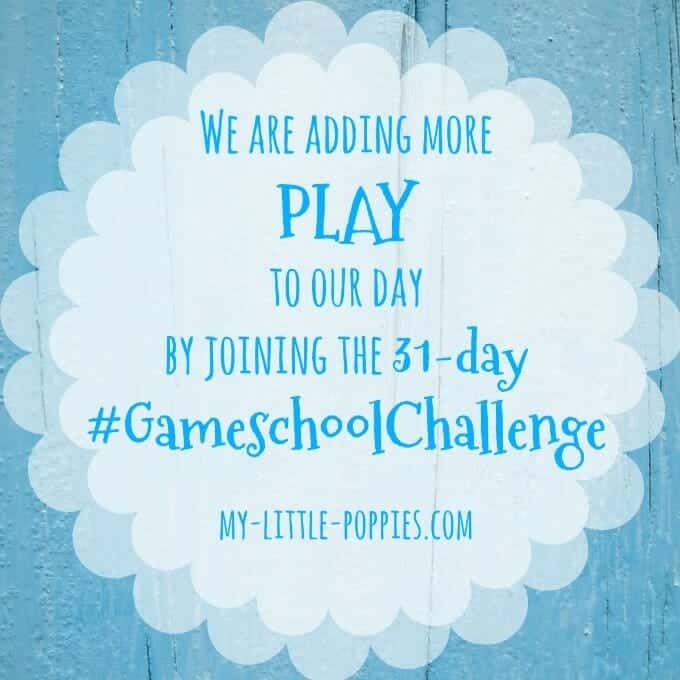 We are loving the Gameschool Challenge! Thank you for your posts, Cait! We are loving Dragonwood and Prime Climb right now! Thank you for all of the wonderful information and for helping to bring play to the forefront of our homeschool? Our favorite game right now is Codenames. I’m really wanting to love Roborally, but I need to find a way to not let the timer stress me (or my kids!) out! We love Ticket to Ride! Our current favorite game is Payday when our youngest is playing and Sequence when it’s the older boys and my husband and I. Right now, our favorite game is probably Sushi Go! or Dragonwood. We are also big Harry Potter Clue fans. My favorite for my husband and I is Agricola (or the two person version). For my kids, we enjoy Castle Keep. Clue and Monopoly Jr. are our favorites right now. They’re both new to us. Our favorite game right now is 7 Wonders. We just ventured into the world of card collecting type games and we are LOVING it. So much so that after only 10 play throughs of 7 Wonders I had to pick up an expansion. I think I am an expansion addict as much as I am a board game addict! haha. We also played PicWits last night as a family to include our 6 year old and HE LOVED it. So I sense that will be a new family favorite! Our biggest obstacle is having enough child friendly games. My oldest is 4 and we only have about 5 games that he can play. So it’s a lot of the same thing over and over and me trying to get creative with what we do have. Our favorite family adult board game is sheriff of nottingham. I would say that upper middle schoolers could play this as well. I used to love Trivial Pursuit when I was younger… I just ordered a few new board games for my kids, so hopefully we will find a new favorite soon! Hmmmm…..Sometimes it’s me. I detest those really long games with very little strategy. Sometimes it’s my 8 year old board flipper! I’m trying to sign up for access to the Ultimate Gamelist but whenever I type my details in and hit subscribe nothing happens. Help! Anna, I am sorry for this. Could you please check your spam folder for the next 24 hours? If you do not receive anything, you can email me with permission to add your address manually. Thanks and sorry for the trouble!